Can You Put Heated Floors Under Hardwood? In many ways, hardwood is the perfect material for flooring. It’s significantly easier to clean than carpet and doesn’t trap pollen, pet dander, or other allergens. It’s elegant and timeless, boosts the value of your home and can last for decades without needing to be replaced. Hardwood floors are also versatile, with enough variety in their appearance to match any style home. But despite all these advantages, homeowners often question whether hardwood floors are right for them. Often, their greatest source of worry is that these floors won’t mesh with their more modern sensibilities. They wonder if an old-fashioned type of flooring such as hardwood can be integrated with the cutting-edge technologies today’s homeowners have come to expect. One such technology is heated flooring, and homeowners are frequently asking the question: can you put heated floors under hardwood? 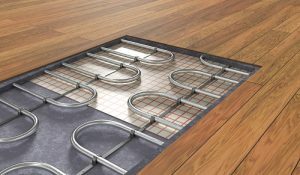 One of the most popular trends in modern housing, floor heating has already earned a reputation as a feature in luxury homes. It is also known as radiant floor heating because rather than simply heating the floor for the comfort of your feet, it actually serves as a heat source for your entire home. In this way, floor heating can replace traditional heating systems such as radiators. There are two ways to heat your floor. Either an electric-based system or a water-based one. If your radiant floor heating is electric-based, then it provides heat through a system of wiring that runs underneath your floor. Water-based heating achieves the same effect through pipes that run hot water underneath the floor. Installation of underfloor heating is usually relatively easy; however, your floor will have to be pulled up to install your heat source underneath. Often, the concept of this worries homeowners who fear the installation will be too expensive. While it can certainly be pricey to add underfloor heating to your home, it’s generally not too bad if you include it in a home building or renovation project. Also, the benefits of floor heating usually outweigh the upfront cost. Floor heating has a number of advantages over more traditional home heating systems. For example, since the piping or wiring that provides heat to your floor does so consistently across its entire surface area, the whole room will be heated evenly as well. This is in contrast to a radiator or other type of heater: these generate heat out from a small, localized source and it will tend to be colder the further away you get from them. Frequently, you’ll feel too hot near the radiator and too cold as you get further from it. Floor heating is also significantly more energy efficient, due simply to the fact that you get consistent heating and don’t need to crank the temperature way up just to heat the whole room. On average, homeowners save approximately 15% on their energy bills after they switch to floor heating. This type of heating also contributes to improved air quality. Due to the fact that radiators heat up one spot in the room and leave others cold, the warm air tends to rise and circulate, carrying with it dust, dander, and other allergens. Underfloor heating, as it heats the home consistently, will not cause the allergens and pollutants in your home to circulate to nearly the same degree. While some homeowners do opt to install underfloor heating as a DIY project, contacting a professional is the safest way to go unless you have significant training. The floor will need to be pulled up and the piping or wiring system installed from there. After it’s installed, a covering compound will need to be placed over it in order to level the floor. This will take a day or so to dry, and then the floor can be added back. The whole process can be done in a few days and will usually only add about a half inch or so to the height of your floor. But Can You Put Heated Floors Under Hardwood? Of course! While we understand you might have reservations as to why this would work, it definitely does. The reality is, you needn’t worry. Heated floors can be installed underneath absolutely any flooring material. Vinyl, tile, carpet; it’s all fair game. However, when it comes to hardwood floors, there are a few limitations to keep in mind. When you have underfloor heating placed underneath hardwood, you do need to consider the type of flooring material you are using. Wood that is too thick or dense, or too prone to swelling or shrinkage, should not be used as the heat will either not conduct properly or could actually damage your floor. It’s also best to use floating floors for the installation. Under no circumstances do you want to have your hardwood floor nailed down; the metal nails may interfere with your heat source. Glue is also not a great choice; while the radiant underfloor heat may not harm the wood, it may melt the glue holding the floorboards down and make it more difficult to perform repairs in the future. Your best bet is to install interlocking planks of hardwood over the top of your heating element. If you’re interested in putting a heating element underneath the hardwood floorboards of your home, the first thing you should do is contact a professional who specializes in hardwood floors. Our team at Wall2Wall is happy to help. We are located in Portland, Oregon and specialize in the installation, repair, and maintenance of hardwood floors. Our professionals can also inspect your floor and offer a quote on the installation of heating underneath your floors, as well as advise you on the best types of wood to use to extend the life of your floor and heat your home perfectly. This entry was posted in Hardwood Floors, Services on November 7, 2018 by Oregon Hardwood Floors.